Yes, distributors profit from embracing the new era of collaboration. We need banking, but do we need banks? We need groceries but do we need supermarkets? We need services and consumables but do we need to receive these things in traditional ways? Do we need distributors? The answer is: Only if distributors truly create value in the process of getting stuff from the source to the user. At my seminars, when I ask distributors what their product is—the usual answer is service. WRONG! Your product is logistics. WalMart has done an excellent job of disintermediating those that Sam Walton believed did not add enough value to the chain. What about your customers and suppliers? What do they say about you? My research indicates that for you to cost effectively achieve world-class levels of logistic services, you must adapt Total Organizational Partnering. I realize partnering is a term that has been grossly abused over the last decade, none-the-less; it is what you must achieve. Partnering is an idea that is loosely used to describe anything from teamwork to alliances to contractual partnerships. Partnering, as I define it, is the process of two or more entities coming together for the purpose of creating synergistic solutions to their mutual challenges. Again, I recommend you adopt Total Organizational Partnering as your business strategy. Today’s distributors profit through embracing this paradigm. Partnering is not a flavor-of-the-month management strategy to be hastily adopted and then as quickly abandoned, rather a long-term strategy for success. Partnering is not instant gratification! To adopt Total Organizational Partnering, distributors will need to understand the Partnering Pentad Model. A pentad is simply the name given to a group of five. The Partnering Pentad represents the five key areas of your business. In each of the five areas you must develop outrageously successful relationship (alliance) strategies. It is the quality of these relationships that hold all the areas together. Distributors profit from Total Organizational Partnering. This is the area of your business where you develop alliances with outside entities for activities where you have core competencies that complement one another. For many distributors, these include buying/marketing groups and targeted specialty alliances for software/technology development. Distributors profit from sharing core strengths, tow or more can create an environment of synergy yielding all involved more than the some total of their collective contributions. Land mines to watch out for are core values of alliance members being too different; circles of interest overlap being too little, and continual management change of one or more alliance partners. Many distributors are most concerned with this area—no supplier, certainly no customer. Just-in-time delivery (JIT) and electronic data interchange (EDI) ordering have become commonplace today. Eventually, you will have these relationships both up and down the supply chain—providing you are still in business. Frequently, what I here from suppliers about their customers is, “They’re talking marriage but acting one night stand.” Not long ago I delivered an opening keynote presentation to an association of industrial distributors. Unfortunately, upon visiting the Website of one of that industry’s major suppliers, I noticed that very few of their distributors had hyperlinks to the distributors’ own Websites. I call that incredibly stupid—missed opportunity. To successfully compete in the world of B2B e-commerce, you must adopt alliances. The biggest land mine in this area is to neglect reviewing the quality of the relationship and exploring areas for improvement. What is it that you do that your suppliers cannot? Which of your activities actually adds value to your suppliers’ efforts and desire to get their goods to the end user? Distributors profit from incredibly close relationships with their customers. In this area, distributors profit from being externally driven. Your customers will consider you an important vendor as long as they feel they’re receiving good value. Value-added is a term that much is being written about. Integrator, Applied Distributors, is now documenting their value-added services with their customers. Agriculture and food processing conglomerate, Cargill has moved to value-based purchasing. They measure the total value proposition of their suppliers rather than just buy on price alone. You must be value driven rather than product driven to understand what your customers want. What they perceive as value is their reality. The important land mine to watch out for is short-term thinking on your part when making customer relationship decisions. This is the final and in many ways the most important leg of the pentad star. 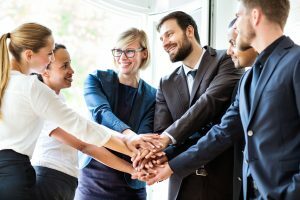 Not the most important from the perspective that all revolves around the CEO, but rather distributors profit from that of having a culture of true partnering. True partnering start at the top. You must lead the charge and show by your actions, more than your words, that Total Organizational Partnering is truly your preferred and accepted business strategy. The critical land mine here is when you arrogantly believe that you are at the center of the pentad and that all the alliances should revolve around you. The coveted center of the pentad star is reserved for all the relationships that bind the separate legs. The Partnering Alliance driver for distributors profit in this new era. Large multinational companies are building alliance relationships to gobble up market shares in every conceivable industry and location. Large families of businesses are competing against one another. As such, smaller organizations feel the pressure and the Partnering trend becomes monkeys see, monkeys do. A secondary driver is based on the fact that organizations generally adopt a new paradigm based on the recommendations of others. Change evolves through one’s witnessing the success of others. Organizations and leaders with strong reputations within an industry or economy have immense influence over their contemporaries. While I have witnessed many companies profit handsomely from alliance relationships, I have also seen them scramble to get on the partnering bandwagon with little regard for the quality of partners they select. Admirable businesses like Timex have discovered that the wrong partner can cost millions of dollars. Creating successful Partnering Alliances that will pay off in terms of increased market share, know-how or earnings diversification is no easy chore. A consolidation or rollup, as it’s frequently called, generally occurs when an organization or individual with deep pockets sets out to buy several small companies in a fragmented industry and rein them in under a new or collective pennant. Does this sound familiar? A while back the National Association of Wholesale-Distributors reported that 42 of the 54 industries they studied had been significantly affected by consolidation. Frequently a professional management and buying strength create economies of scale that allows the consolidator to pluck the low hanging fruit in the industry. Distributors profit form significant investment in systems to eliminate the duplication of effort and inefficiencies that exist within the industry being consolidated. If your organization is sick and bleeding, this plan will not deliver the quick results you most likely desire. As I stated, this is not a quick fix. If you lead a healthy organization, your best strategy to remain profitable and independent is Total Organizational Partnering. To protect against being disintermediated, stable and incremental improvement in all five pentad areas will deliver the most successful long-term results. Total Organizational Partnering will assist distributors profit in becoming a world-class distributor—one that adds value to the chain and understands logistics.